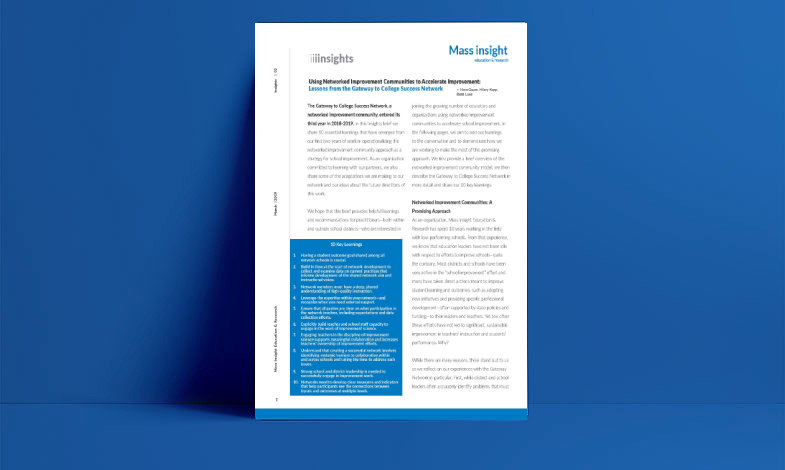 Access our new “Insights” research series as well previous research and policy briefs about school improvement and AP STEM education. The Gateway to College Success Network, a networked improvement community, entered its third year in 2018-2019. In this Insights brief we share 10 essential learnings that have emerged from our first two years of work in operationalizing the networked improvement community approach as a strategy for school improvement. Having a student outcome goal shared among all network schools is crucial. Build in time at the start of network development to collect and examine data on current practices that informs development of the shared network aim and instructional vision. Network members must have a deep, shared understanding of high-quality instruction. Leverage the expertise within your network - and recognize when you need external support. Ensure that all parties are clear on what participation in the network involves, including expectations and data collection efforts. Explicitly build teacher and school staff capacity to engage in the work of improvement science. Engaging teachers in the discipline of improvement science supports meaningful collaboration and increases teachers' ownership of improvement efforts. Understand that creating a successful network involves identifying systemic barriers to collaboration within and across schools and taking the time to address such issues. Strong school and district leadership is needed to successfully engage in improvement work. Networks need to develop clear measures and indicators that help participants see the connections between inputs and outcomes at multiple levels. Increasing the number of workers with an education beyond high school, and preferably with a four-year college degree, is an economic imperative and is also critical to give workers and their families greater economic stability and security.